A CCW Permit Online? In Under an Hour? Get a carry permit online in under an hour? Sound too good to be true? Well, it is – but keep reading anyway because it is almost that easy. There is an online resource called Carry Academy that, although it doesn’t get you your actual permit, could save you a lot of time and money on your path to concealed carry by taking care of training requirements online in about 45 minutes. Then all that’s left is for you to apply for your permit. A common course of action for many, if not most, applicants goes something like this… You decide you want to carry a concealed weapon so you start hunting around for information about how to get a license and (usually) find that the process involves some sort of training. So then you look for instructors in your area who teach the required class and hope that you can find one that fits into your schedule. If you get lucky and find one that fits, you wait for training day to roll around, pay the course fee, spend the whole day in class and wait for your certificate of completion to show up so that you can submit it with your permit application and start the real wait. The Carry Academy fast forwards the process for many by providing an on-demand firearms safety course online any time you want and costing only $50. The online course condenses much of the material that you would otherwise get in the classroom into a 30 minute video. The video covers a variety of topics including ammunition basics, handgun safety and handgun basics, including the semi-auto and revolver parts, safeties, operation, disassembly, cleaning and shooting tips. The video also covers general CCW laws and practices and certain scenarios such as interaction with law enforcement. Following the video course, users are presented with a 20 question exam consisting of multiple choice and true/false questions. The exam must be passed with a score of 75% or higher (15 or more correct answers) to successfully complete the course. If the first attempt is not successful, users have 30 days to watch the video and retake the exam. How Does it Compare to a Classroom Course? When I originally took my CCDW class, I did so in a traditional classroom setting, generally following the process described above. I spent the majority of a weekend day in a classroom, dividing time between listening to an instructor talk about the same topics covered at Carry Academy and watching videos that mainly dealt with our state’s specific carry laws. This was followed by an exam similar to Carry Academy’s. The largest difference was that, as per our state’s laws, our class included a live fire portion in which participants had 20 shots to get 11 rounds into a man sized target at barely more than stabbing distance. 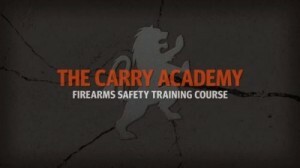 I took the Carry Academy class recently to see how it compared to the classroom training. Of course, in the Carry Academy setting, there is no dialog between participants and the instructors. By the same token, however, there was no opportunity for the instructor to interject opinions, stories and other tidbits that aren’t necessarily relevant to the task at hand. Much of the time taken up in the classroom consisted of handholding; making sure that each person successfully disassembled there firearm and understood the basics of operation and cleaning. The Carry Academy course showed examples on semi-automatic pistols and revolvers, but left the details to the individual, directing them to their specific firearm’s user manual. The Carry Academy course makes no bones about what it is – “a general handgun safety course” and not a comprehensive course covering every aspect of concealed carry. Whereas half or more of our classroom time was spent watching videos about state-specific laws, the video lesson directs users to study their specific statutes on their own. This is sage advice no matter where you receive your training – especially given that some information given by our classroom instructor was out of date. As mentioned, the striking difference between courses was the lack of live fire in the Carry Academy course. This is due to the fact that there is no live fire requirement for the permits that this course focuses on. More on that in the next section. As far as cost and convenience goes, the Carry Academy class price was 1/3 less than that of the classroom version. Convenience is a hands-down win for Carry Academy as you can complete it in the comfort of your own home, on your own time and in less than an hour. I watched the full 30 minute video and then scored 100% on the exam, which took only another 6 minutes. The Carry Academy class meets training requirements that allow successful participants to apply for permits that will allow them to carry concealed in dozens of states. This doesn’t necessarily mean that you can use a Carry Academy certificate of completion to get a permit in all of those states, however. Completion of the course meets carry permit requirements for residents of Iowa, Oregon and Virginia. Of wider interest is that the class also meets the training requirements toward obtaining a non-resident Virginia CCW permit, which is honored by numerous other states. Instructions for applying for a Virginia non-resident permit, along with application download links, are also provided on the Carry Academy website. Some critics feel that online training doesn’t (or shouldn’t) be acceptable as meeting CCW training requirements. Others disagree with this stance on a number of points. The notion that law-abiding citizens must ask permission to keep and bear arms (i.e. get a carry permit) is abhorrent to many. The high costs of permits and mandatory training, along with other hoops that must be jumped through before exercising the right is even more offensive to some. This is especially nonsensical in areas where citizens can openly carry a firearm without a permit but must meet a battery of requirements before pulling their shirt over their firearm. Of course someone who walks around with a loaded firearm should know how to safely handle and use it. Of course they should be familiar with local, state and federal laws. Of course they should be proficient shooters. The idea that those things can only be accomplished (or can be accomplished at all) by spending seven hours, a hundred bucks and 20 rounds of ammo sounds like something that a classroom instructor would say. Being well familiarized with firearms (and having previously completed CCDW training), I found the training video somewhat a little slow for me despite containing good information and the video lesson could likely be very helpful for firearms beginners. I don’t feel like I learned a great deal more about firearm safety in the classroom than I did in the Carry Academy course. Especially when the Carry Academy course is coupled with independent study on the operation of your specific firearm and state laws – which one should be doing no matter where training is received – I feel like the classes are essentially equivalent and either is adequate for what carry permits require. No matter what the opinions of critics or proponents of online CCW training are, the one thing that really matters is whether or not the training is accepted by the relevant permit issuing body. In the case of Carry Academy and CCW permits in Iowa, Oregon and Virginia, that answer is yes. So if you’re trying to figure out how to fit your training requirements into your busy schedule, check out the course offered by Carry Academy. And, of course, don’t forget to do your own due diligence when it comes to knowing your firearm and your local laws. 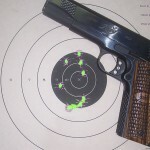 5 Responses to A CCW Permit Online? In Under an Hour? the requirement is for SAFETY training not CONCEALED CARRY training. you can learn just as much about basic safety from a video as you can from some guy in a class room. your right that its something that the teachers push, it puts more people in their class and more $$$ in their pocket. I don’t like this scheme. It can never be as good as real instruction from a real instructor in a real classroom where you can learn about your specific gun and your specific carry laws and other defensive shooting topics. It seems like its skirting by the training requirements on a technicality. Completing a hunter education or hunter safety course approved by the Virginia Department of Game and Inland Fisheries or a similar agency of another state. Completing any firearms safety or training course or class available to the general public offered by a law-enforcement agency, junior college, college, or private or public institution or organization or firearms training school utilizing instructors certified by the National Rifle Association or the Department of Criminal Justice Services or a similar agency of another state. Completing any law-enforcement firearms safety or training course or class offered for security guards, investigators, special deputies, or any division or subdivision of law enforcement or security enforcement. Presenting evidence of equivalent experience with a firearm through participation in organized shooting competition approved by the Department of State Police or current military service or proof of an honorable discharge from any branch of the armed services. Obtaining or previously having held a license to carry a firearm in this Commonwealth or a locality thereof, unless such license has been revoked for cause. Completing any governmental police agency firearms training course and qualifying to carry a firearm in the course of normal police duties. Completing any other firearms training that the Virginia Department of State Police deems adequate. If they didn’t want to accept online training, they wouldn’t specifically allow for it in the law! Your Article Helped me a lot. Probably the best article on the internet, I really loved to read your more article.Keep up the great Work Cheers Up!